BMW 520d Efficient Dynamics review | What Car? What is it? Audi and Mercedes-Benz must be pulling out their collective hair. No sooner have they launched business-focused versions of their respective executive saloons than BMW comes along and blows them away with its 520d Efficient Dynamics. Headline figures for this ultra-efficient 2.0-litre diesel 5 Series saloon include a power output of 181bhp, average economy of 62.8mpg and CO2 emissions of 119g/km. However, the real number of note for business users is the 13% company car tax rating. Choose a diesel-engined version of Audis A6 or Mercedes E-Class and the best you can hope for will be a tax bill calculated on 18% of each models list price. Whats it like to drive? If youre thinking some of the 5 Series driving talent must have been sacrificed at the altar of efficiency, then think again. The 2.0-litre turbodiesel engine is more than strong enough to overcome the revised higher gearing fitted to the ED, so performance remains strong, with sharp acceleration and plenty of in-gear flexibility. Equally, comfort and handling ability remain undiminished. As with all 5 Series models, the ED is quiet, refined and comfortable sitting on the motorway youd struggle to differentiate between this cost-saving edition and the luxurious top-of-the-range 550i. If there's a downside to the 520d ED is that it's not availavble with an automatic gearbox, which may put off some buyers. Whats it like inside? Smartly styled and built from high-quality materials, the EDs interior is a bastion of good taste and understated elegance. Theres also loads of space for four and a big boot. The seats are supportive and BMWs class-leading iDrive control system lets the driver scroll between infotainment functions without their eyes from the road ahead. The cabin is a brilliant place to spend time, which is just as well given that the ED can cover up to 967 miles between fuel stops. Should I buy one? If youre a business user youd be crazy not to consider it. With its excellent fuel economy and low tax rating, the 520d ED is a simply staggering achievement and one that puts the 5 Series way ahead of the opposition. Even without these incentives, though, the 520d ED makes perfect sense. 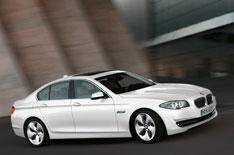 Smooth, refined, comfortable and spacious, its a superb executive car without comparison. BMW at its brilliant best.